New and Improved - 3rd Edition. Now packed with even more information!!! Raise Your Own Bees and Reap the Sweet Rewards! Do you love honey? Would you like to keep your own colonies of bees? Are you interested in pollinating flowers and trees? Do you want to make more money from your hobby? 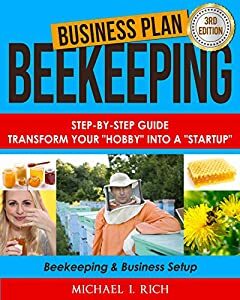 If so, Business Plan: Beekeeping - Step-By-Step Guide: Transform Your â€œHobbyâ€ Into A â€œStartupâ€ â€“ Beekeeping & Business Setup is the book youâ€™ve been looking for. Apiculture (the official name for beekeeping) is an exciting and lucrative hobby. With the right knowledge and planning, you can turn your part-time passion for beekeeping into a full-time career! Remember - You donâ€™t need a Kindle device to read this book â€“ you can buy and read instantly on your computer, phone, or tablet! If you want to start a beekeeping business, â€œbeeâ€ sure to read this essential introduction to bees and beekeeping. This millennium-old practice can mean big profits for you â€“ with the right understandings of biology, bee sociology, and business. From sourcing your bees to financing your beekeeping business, this book has the detailed and powerful information you need to make it big in the bee products industry! Donâ€™t wait another day to start getting paid for your hobby - Download Business Plan: Beekeeping right away! Enjoy Double Bonus inside - 2 additional books, absolutely FREE.